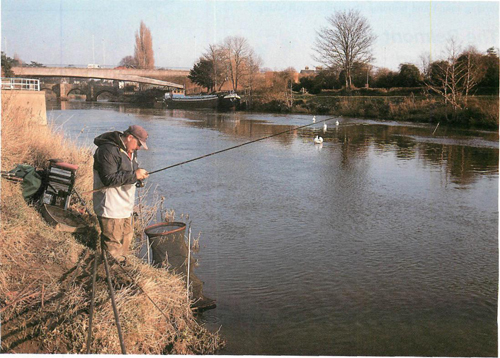 We join Colin in mid January on the Belmont stretch of the Wye in Hereford town centre. It is a cold, clear, crisp morning and the ground is iron-hard from an overnight frost. On most waters these conditions spell disaster but Colin makes a cheerful prediction: ‘That is the beauty of the Wye – the roach feed even when the water is freezing (which it is).’ Looking into the deep, icy-green waters churning slowly at Colin’s feet, it isn’t easy to share his optimism. From its source high in the Cambrian mountains to its meeting with the Severn Estuary, the Wye remains relatively untouched by pollution. Apart from supporting coarse fish, its clean waters are highly esteemed for salmon. Every season, a grub bait ban operates until the end of September. This protects salmon parr from baits such as maggots and in doing so preserves the salmon fishing. 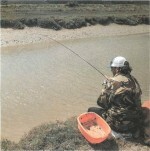 But the restriction has an effect on coarse fishing too. It means that come autumn – when dace, roach, chub and bleak do finally meet maggots – they go absolutely bananas, feeding ravenously. Bear in mind the number of fish in this river’s vast shoals and it is easy to see why the Wye yields 80lb (36kg) bags. He twiddles a knob enthusiastically so that the lenses move in and out. ‘They’re great for long-range float fishing.’ The trouble with Colin Branson is that he is so jovial you can’t always tell whether he is being serious or just joking. Colin hedges his bets by setting up no less than five different rigs: a stick float and running line, a heavy pole rig with a flick tip, a lighter pole rig (again with a flick tip), a bleak whip and a feeder rig. It is really a matter of trying out a few methods and seeing which one brings the best response – some rigs might not even get touched. Colin thinks it unlikely the bleak will oblige because the water is too clear. What he’d really like to demonstrate is his technique for the dace – holding back with a heavy pole rig – but he is going to start on the block-end feeder. This is a diagnostic tactic used for finding out which species are feeding and whereabouts in the swim they are. He winds in the feeder and, without putting any bait in, drops it about 10m (33ft) downstream. By using an empty feeder he can see if there are any roach well down the swim – where they are often found – without taking them even farther downstream. A quick stab of the tip and Colin strikes – fractionally too late. It’s time to try something else. Making sure that your hookbait and feed end up in the same place can be a problem on this deep, powerful river. If you don’t get your loose feed down at the head of the swim, it won’t reach the bottom (where the fish are) for about 20 metres (22yds) or more – and in a match this may be in an opponent’s swim! A bait dropper is an excellent device for getting the bait down quickly. Colin uses his pole to introduce three droppers full of bronze maggots about 9m (30ft) from the bank and 4m (13ft) upstream. This lays a carpet of feed at the top of the swim where he hopes (eventually) to catch. Then he makes up a heavy mix of white and brown crumb and adds a few handfuls of loose maggots. He runs the black-topped stick float along a crease between the slow and slightly faster water. It is about 3.7m (12ft) deep here. The float travels perhaps 15m (50ft) down the swim before it suddenly buries. A smart strike and the spliced rod tip takes on a healthy curve, juddering occasionally as the fish is coaxed reluctantly up the river. Colin brings it slightly upstream of his landing net and then draws it back downstream – using the current to slide it smoothly into the net. This is a better fish! It’s a scale-perfect, crimson-finned roach of about 134lb (0.6kg). Colin has been feeding a tangerine-sized ball of groundbait every 3-4 minutes, hoping to bring the fish up the swim. He is going to try his heavy pole rig to see whether there is anything in front of him. This is one of those rare days when you might underestimate the amount of fish in the net. But Colin still hasn’t settled with any one method – he’s gone back on to the stick again and stepped up the feed rate to a ball every other cast – trying to tempt those roach into coming closer. The float trips through at the speed of the current – the black top clearly visible among the steely blue reflections of the January sky. It is just beginning to look as though the float might make it to the estuary when Colin strikes – apparently for no reason – and the rod tip springs to life. He is soon sliding yet another pound roach over the net. But what on earth prompted him to strike when the float didn’t seem to budge -has he got X-ray vision, too? He rebaits, casts and lets the float trickle through. This time a bit of extra concentration solves the mystery. When the float reaches the same spot it drops almost imperceptibly – threatening to go under but without actually doing so. The theory is that 3.7m (12ft) below the surface a crafty fish is mouthing the bait without actually swimming away with it. A smart strike proves the theory correct and after a minute of carefully playing the fish Colin holds it up and, yes – you’ve guessed it – it’s another pristine one pound (0.45kg) roach. The lesson here is that a float doesn’t always register a bite by disappearing. Funny thing with angling – days often don’t turn out as you’d expect. Colin came in search of dace and found roach. He grins as he slips yet another roach in the net. ‘We could be on for 30lb (13.6kg) here,’ he says. He wasn’t wrong. In spite of the freezing waters the fish kept coming and with the sun still shining on the Wye Valley there really couldn’t be a pleasanter way to spend an afternoon.